This is part of a cornice with plant decoration on both sides. 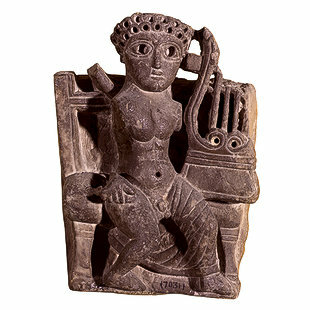 In the front is an ornament representing the upper part of the god Nilus with the god Harpocrates on his left shoulder. Nilus was usually depicted in the form of the bust of a man carrying small children. It is believed that the children represented the River Nile tributaries. It has also been suggested that the children represent the offerings presented to the river. The 16 children are perhaps a symbol of the amount of the flood, 16 cubits, that covered the land of Egypt. On the back of this piece is a picture of the Indian lotus flower. This piece of art dates back to the transitory stage of Coptic art in which Greek legends were carved in a simple popular style.